I have been trying to branch out my cooking, and try a few new recipes this fall. One of them is chili! This is a wonderful thing to make for a cold day, and it's nice that it makes a lot so you have leftovers. It's also nice to use the crock-pot, which is something I have been trying to use more. The first time I made chili, I used a friend's recipe. It worked out really well, although the recipe used a lot of garlic and onion, which is something I am not used to cooking with. It was really good, but with not being big garlic eaters, I wanted to tweak it a little. 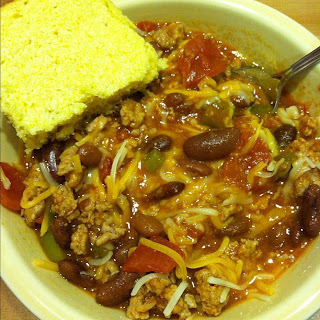 The picture above is from the second time I made chili, and it turned out awesome. I am definitely adding chili to my repertoire, and will probably make it a lot this winter. I used the same recipe, but this time I used pork instead of beef (it's cheaper), and I used a whole green pepper instead of the onion and garlic. I also made a cheap box of Jiffy cornbread on the side. I think the original recipe said to cook it 4-5 hours on high. The first time I made it, I cooked it for 4 hours, the second only 3. Both times were fine and it was done and hot. You should try it! It's delicious, and you have at least two meals worth for around $11!